While many dogs dream of the day they'll catch a nice deer or antelope, most pups lack the patience it requires and are too often distracted by squirrels. 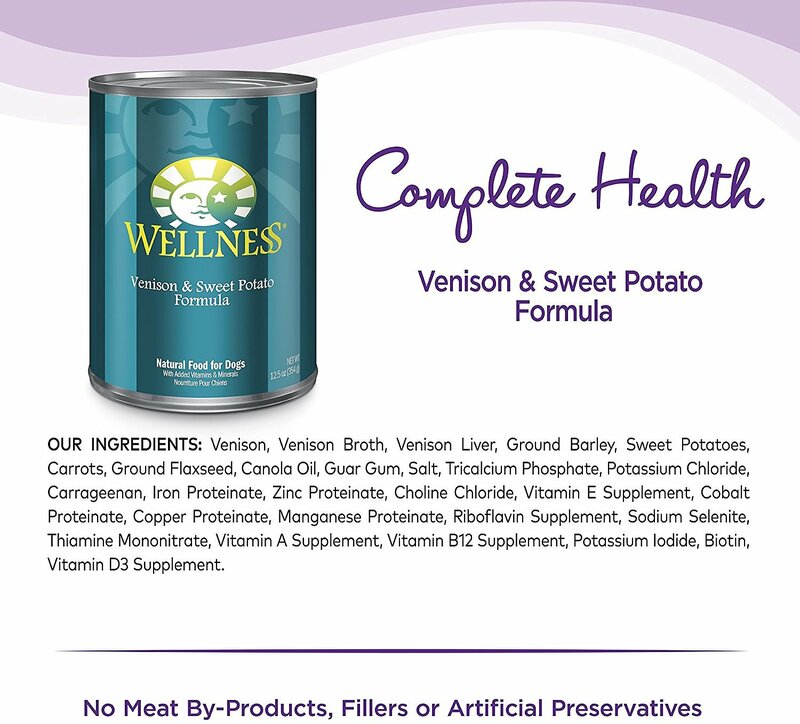 Bring the venison to them with Wellness Venison and Sweet Potato Formula Canned Dog Food. Venison is a high-quality, easily-digested protein source that's just as easy on the tummy as it is on the taste buds. 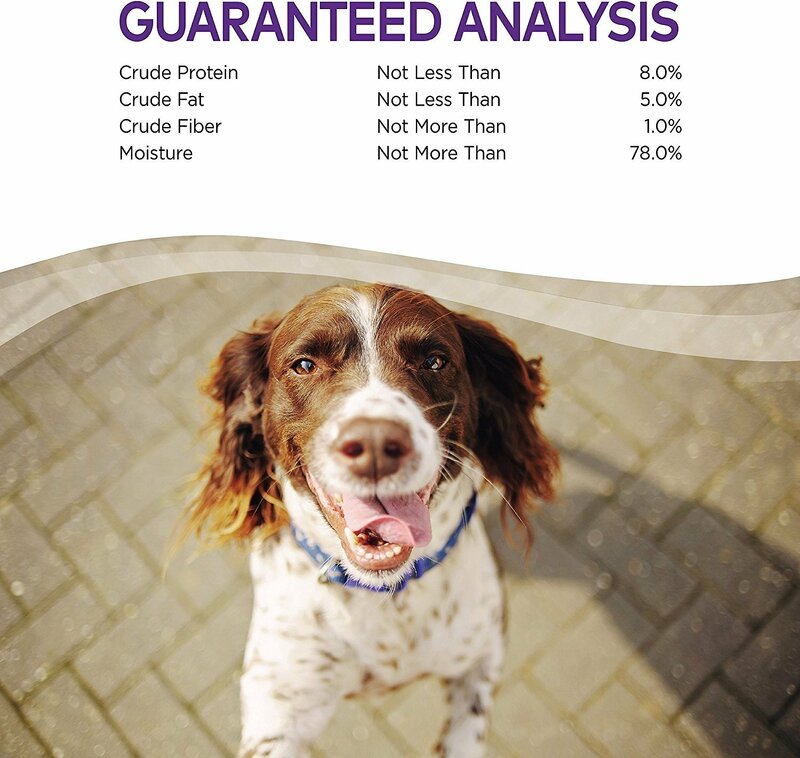 Ground flaxseed boosts the immune system and provides Omega 3 fatty acids essential to maintaining a healthy coat. Serve at room temperature. Cover and refrigerate the unused portion. The amount of food your dog requires depends on age, activity level, breed and environment. Always provide access to clean, fresh water. Feed 1 can (6 oz) for every 8 lbs of body weight per day. Feed 1 can (12.5 oz) for every 15 lbs of body weight per day. For combination feeding, reduce dry by 1/3 cup for every 6 oz of wet food. Feed up to twice the Adult amount to puppies. Intended for intermittent and supplemental feeding only. I didn't read the fine print. This is only to be used as a topper or food complimentary, "to be fed with complete and balanced dog food diet." 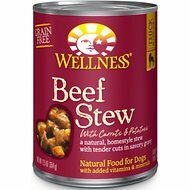 Also no where on the can does it say it "meets the nutritional levels established by the AAFCO Dog Food Nutrient Profiles......" Since my Callie is least allergic to Venison, I thought this food would be the answer. She likes it so I add a few ounces to her kibble and that seems to work. But I could never give her this canned food instead of her kibble. At least that's what I get from my dog. He can't wait for a scoop of this mixed with his dry dog food. Gobbles it up in seconds, which isn't ideal but it's what he does. He loves it! This is only meant as a "topper"
I didn't notice until I received my order but indeed there it was in the feeding instructions to feed only as a complimentary food and is not a complete and balanced diet! Just enough gravy to make the consistency perfect. However, Tia was not as impressed as I was. After the first couple of cans, she would no longer eat it. I recently tried the Venison on my Maltipoo. He loves the Wilderness products. It was a different taste for him at first so I mixed it with his Beef stew and now he loves it. My Biewer Yorkie has severe food allergies....enough to give him seizure like symptoms. He can only have either venison, beef, or turkey. Cannot have potatoes, fish oil, or yeast which seems to be in most foods. 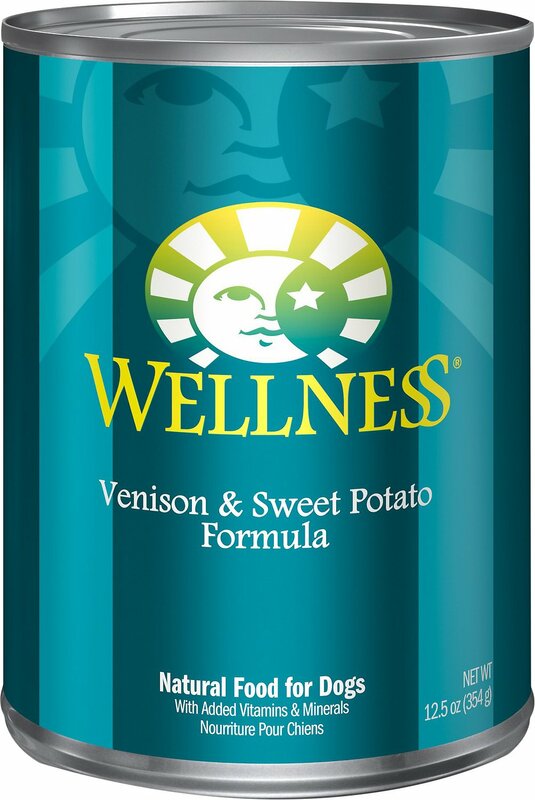 This product only has venison, sweet potatoes, and carrots and meets his requirements. That being said, I despise the mushy consistency, the wasteful gel, and the shrinking amount in the can. If I find a suitable replacement I will not be buying this product. My dog is very happy with all varieties of Wellness canned food mixed with her dry food. I've gotten the green can before. This seems to have a slightly more smearable pate consistency that I like, but nearly each can will have an odd dark chunk in it. 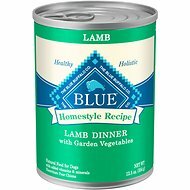 I purchased this as a substitute for the Zignature Venison canned as it was out of stock. 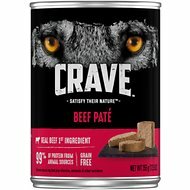 The pate consistency mixes very well with the dry kibble and the pups seem to like the taste. My problem with this product, and I will admit it was my own fault for not reading the label more closely, is that it contains BOTH Guar Gum and Carrageenan. 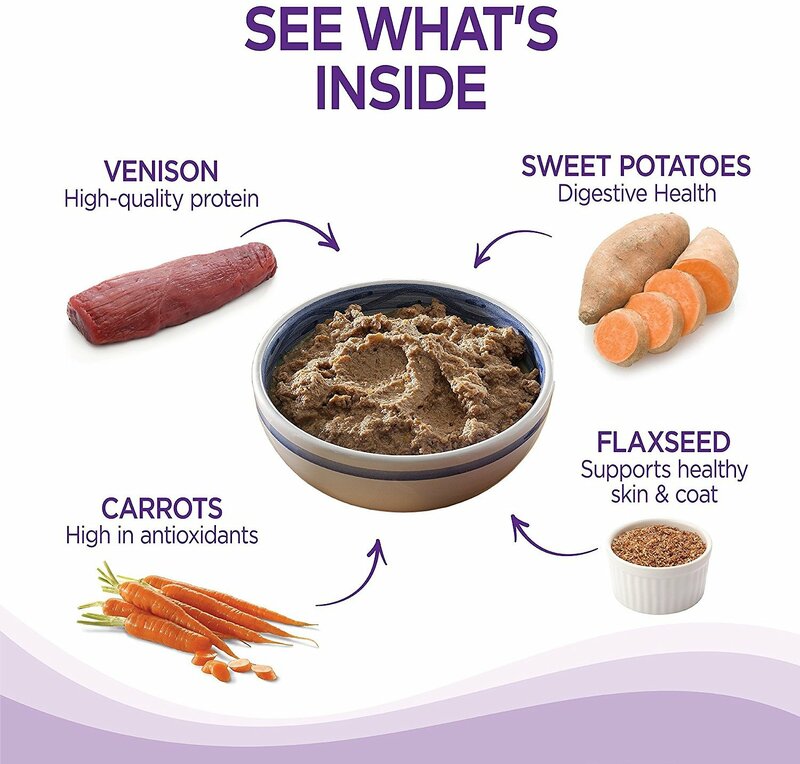 I try to avoid these ingredients in the foods I feed my dogs. I will not purchase this again.